Cork Access Group presented with Centenary Award » Comhar Chathair Chorcai Teo, Cork City Partnership Ltd. The Cork Access Group is the voice of people with disabilities in Cork relative to their access needs. The Group has ongoing discussions and meetings with Bus Eireann, Irish Rail and Cork Airport Authority to promote the disability agenda in the area of public transport. In addition the group meets regularly with Cork City Council engineers, to ensure that the disability perspective is to the forefront in all development work carried out in our city. Cork City Partnership has supported Cork Access Group by providing meeting rooms and administrative support for the past twenty years. Cork City Partnership’s Disability Officer Donie O’Leary is assigned to support the Access Group in that regard. Cork Access Group holds their regular meetings in Cork City Partnership’s community outreach office on Sprigg’s Road just off of Fair Hill. 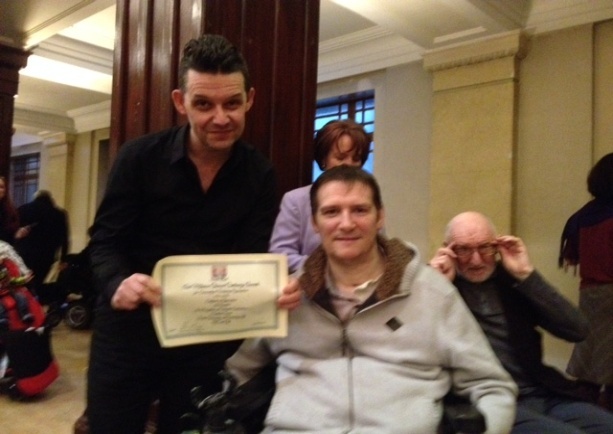 The Access Group received the Centenary parchment in recognition of the collaborative way they work with service providers including Cork City Council to promote the inclusion of people with disabilities in Cork. In a packed city Hall, the award ceremony was presided over by Lord Mayor Chris O’Leary and Chief Executive of Cork City Council Ann Doherty.